Shortly after declaring a psychology major her sophomore year, Sarah Hill ’14 found herself on a fast-track to success. Because of the sweeping variety of classes and professors' breadth of interests in Stonehill’s Psychology Department, she was quickly able to dip her toes into a wide range of niche fields — from child psychology to sports psychology. That, in turn, helped her zero in on her passions: abnormal psychology and counseling. By her junior year, the Londonderry, New Hampshire, native landed her first internship — as a school adjustment counselor at a Brockton elementary school. By her senior year, she had two more: one at a Brockton domestic violence agency and another at Butler Hospital in Providence, Rhode Island. 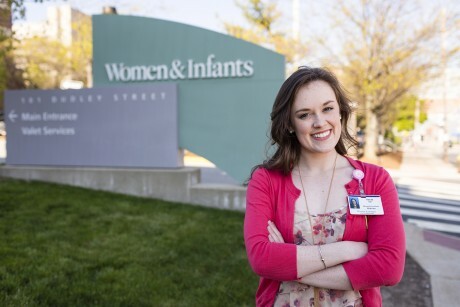 “I had a strong understanding of the types of mental health issues I might encounter — and of what it’s like working in a clinical behavioral health setting — before I even started my job,” said Sarah, who now works as a mental health research assistant at Women & Infants Hospital in Providence. Aside from the hands-on experience of her internships, Sarah said her Stonehill courses provided a solid foundation for her career as a mental health professional, which she started seamlessly after earning her diploma. With the benefits that come from the department’s ample hands-on research opportunities, a new state-of-the-art on-campus research lab and a faculty with diverse research interests, Stonehill psychology graduates are out in the world pursuing rewarding careers. Some have jobs secured before they even cross the stage to receive their diploma. Recent alumni are employed at Boston Children’s Hospital, Yale Alzheimer’s Disease Research Unit, Bradley Children’s Hospital, Brigham & Women’s Hospital, Counseling and Psychotherapy Center Inc., McLean Hospital and South Bay Mental Health, among other major institutions. One competitive advantage that Stonehill psych students have is the opportunity to present at national and regional conferences. Psychology students are also at an advantage when it comes to landing internships at leading hospitals and facilities, including Brigham & Women’s Hospital, The Jimmy Fund, Massachusetts School Hospital Foundation and New England Center for Children. For Peter Krahe ’16, a yearlong internship at Rhode Island Hospital has blossomed into a full-time research assistant position, a role he was able to step into right after earning his degree. Students also have opportunities for hands-on research through Stonehill Undergraduate Research Experience (SURE) — where they can perform full-time, high-quality research under the guidance of an expert faculty researcher — and through the department’s research externship programs at Brown University, Harvard University and UMass Medical Center. “Internship or research experiences provide you with an education that a textbook [simply] cannot,” said Candace Crocker ’16, who recently graduated and was ranked first in the Class of 2016. Before graduating, Candace assisted in research initiatives at the Centers for Behavioral and Preventive Medicine in Providence and is now working full-time as a clinical research assistant coordinating a breast cancer survivorship research grant that was recently won by Erin O'Hea, a professor at Stonehill College and UMass Medical School. Psychology students conduct their research and studies in graduate school-caliber facilities at the Thomas and Mary Shields Science Center — a $34 million, 89,000-square-foot building housing state-of-the-art technology for use in psychology research, including one-way observation rooms, a playroom for children’s psychology research, counseling rooms and computer labs. Today, more than 30 percent attend graduate school, which Tirrell said is close to twice the national average for psychology majors. Alumni have pursued graduate degrees in renowned programs at schools such as Boston College, Boston University, Tufts University, Emerson College, Purdue University, University of Connecticut and California School of Professional Psychology. Georgia Winters ’13, who was named an Honorary Undergraduate Scholar by the New England Psychological Association, is now pursuing a doctorate in forensic clinical psychology at the John Jay School and aspires to be a forensic psychologist. The field of psychology encompasses so much, and Stonehill’s faculty members are so well-versed in such a wide range of branches, that psych majors can essentially design their own curriculum.